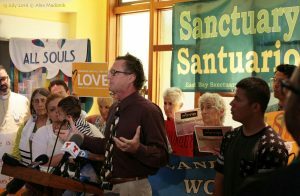 Kehilla members joined with representatives of numerous local congregations on Wednesday, July 13th, to support the University Lutheran Chapel in Berkeley as it declared a renewal of Sanctuary for immigrant refugees facing deportations orders from ICE. The Department of Homeland Security is targeting Central American children and families for deportation, despite the acute dangers they face in their home countries due to gang violence and displacement by multinational corporations. It should be noted that the U.S. has withdrawn all Peace Corps volunteers from Honduras and El Salvador because the security situation in these countries is not acceptable. Pastor Jeff Johnson of ULC and Pastor Max Lynn of St. John’s Presbyterian Church (Berkeley) took turns promising physical Sanctuary to immigrants, and offered blessing to several recently-arrived Central American refugees who in turn told their stories. All have lost family members to gang violence, and faced threats before fleeing their homes. Pastor Jeff recalled that ULC was the first congregation to declare sanctuary during the Central American conflicts of 30 years, ago, and one of the refugees they welcomed at that time, José Artiga, was there with us on Wednesday as the director of SHARE El Salvador, also based at ULC. In fact, his former office at ULC has been turned into a Sanctuary apartment. Other congregations reaffirmed their support, and City Council member Kris Worthington reported that the City of Berkeley has renewed its support as well.